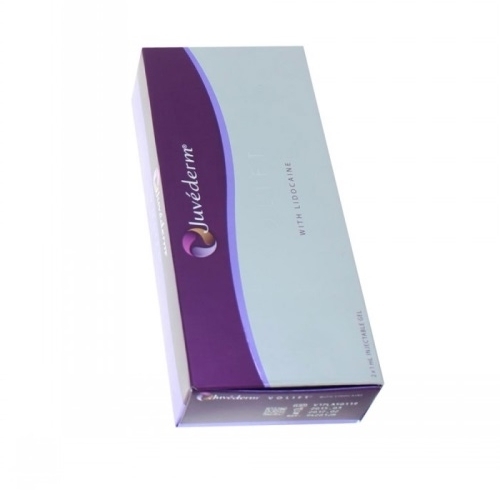 JUV�DERM� VOLIFT� with Lidocaine is a hyaluronic acid filler (AH) of the range and the third JUV�DERM� product developed from the technology VYCROSSTM exclusive to Allergan. Designed to reshape facial contours and deep skin depressions such as nasolabial folds, JUV�DERM� VOLIFT� with Lidocaine offers a new treatment option for mild and lasting results. The addition of a local anesthetic, lidocaine (0.3%), provides patient comfort during treatment and a softer injection experience compared to products not containing local anesthetic. Hyaluronic acid is used in aesthetic medicine as a wrinkle filler. It is injected into the skin, in the form of a transparent gel intradermally. It creates volume by giving a semblance of vitality, good health, or look under .Inject� brilliance of a wrinkle, hyaluronic acid plumps the tissue and gives the skin its smooth, natural and tense. Processing a ride by the injection of hyaluronic acid is generally easy, the results are visible immediately and leave no scars. Treatment of deep skin depressions, remodeling contours, and restore facial volume by injection into the deep dermis and for the restoration of lip volume by qualified medical personnel in accordance with applicable regulations Lovale. Attention injection of Juvederm VOLIFT WITH LIDOCAINE requires a medical procedure that can only be performed by a physician (doctor specializing in dermo-cosmetic dermatologist, plastic surgeon). PRODUCTS SOLD ON OUR SITE ARE PARAPHAMACEUTIQUES PRODUCTS, THEY ARE THEREFORE OVER-THE-COUNTER AND DO NOT REQUIRE PRESCRIPTIONS. This product will not be returned or exchanged. Store the injectable implant in its packaging at controlled room temperature between 15 �C and 32 �C. Do not use the product after the expiration date. The expiry date is printed on the product labels. The syringes used or partly used and needles should be considered as potentially contaminated medical waste. They must be handled and disposed of according to medical practices of the institution and local regulations. Attention injection of Juvederm VOLIFT requires a medical procedure that can only be performed by a physician (doctor specializing in dermo-cosmetic dermatologist, plastic surgeon). Ingredients: Hyaluronic acid gel (17,5mg / mL) 0.3% Lidocaine chlorhydratede Contains: 2 syringes 4 needles 30G1 / 2 "(EC 0123). Purpose: treatment of deep skin depressions, remodeling contours, and restore facial volume by injection into the deep dermis and for the restoration of lip volume by qualified medical personnel in accordance with applicable local regulations.